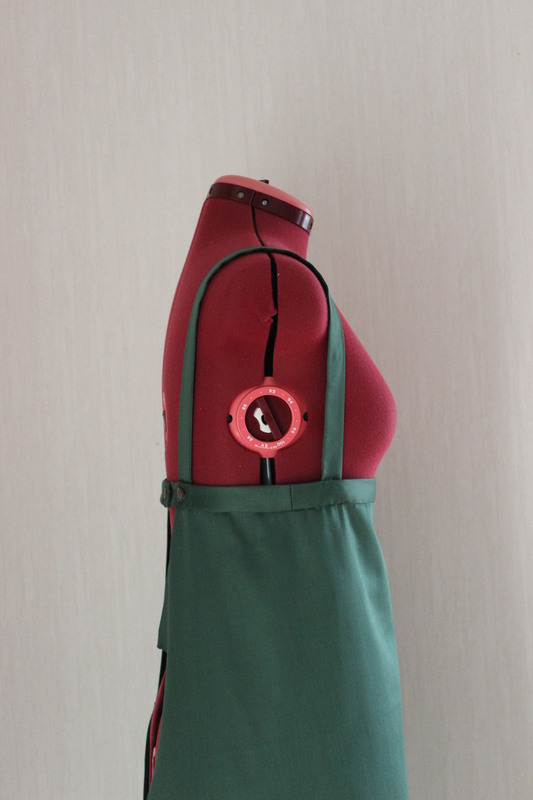 For the photos of my new apron I wanted to try to copy the inspiration print s much as possible, and since I haven’t made the rest of the outfit, I picked some pieces from my existing costume wardrobe that would some what give the right look. 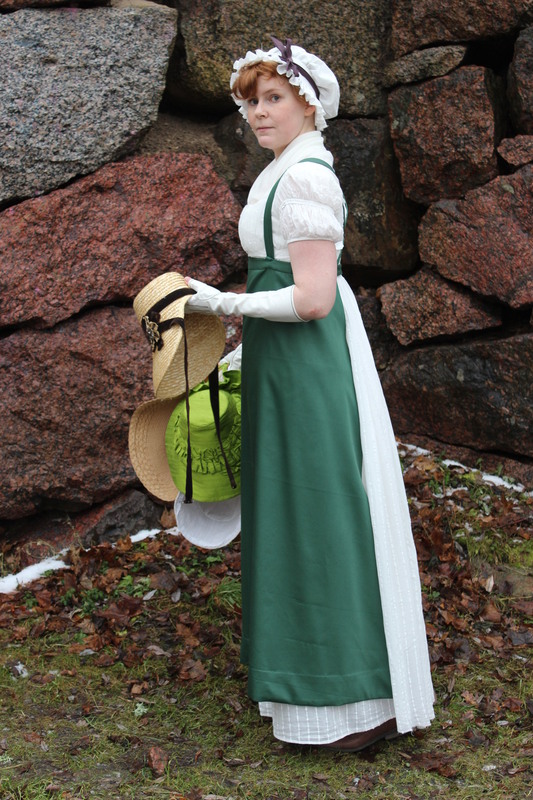 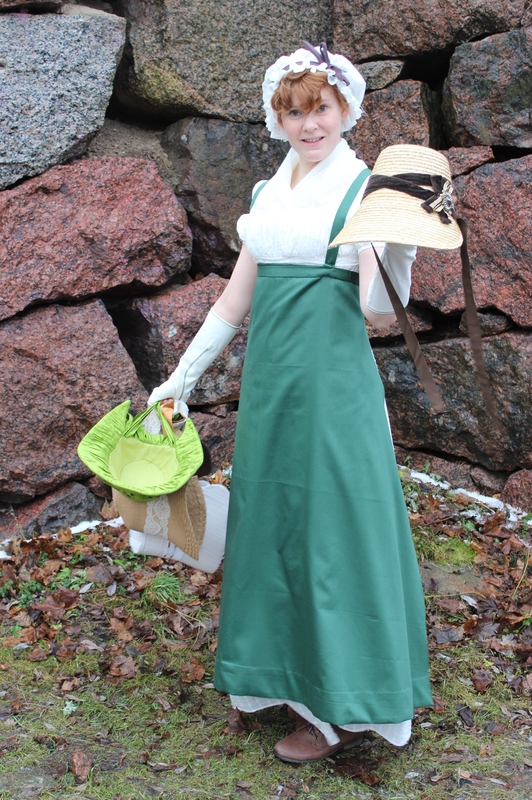 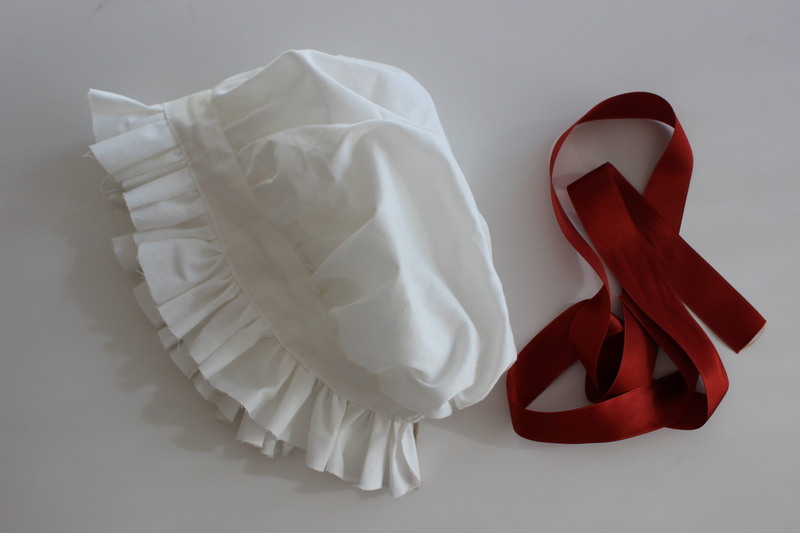 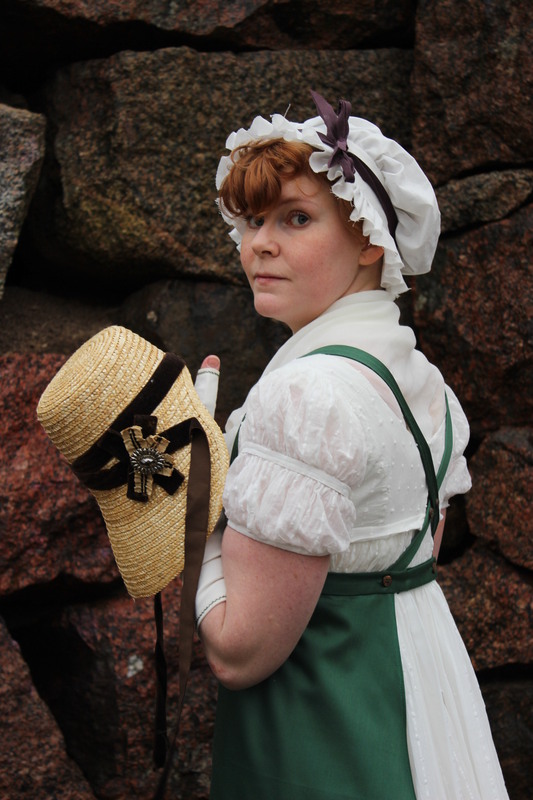 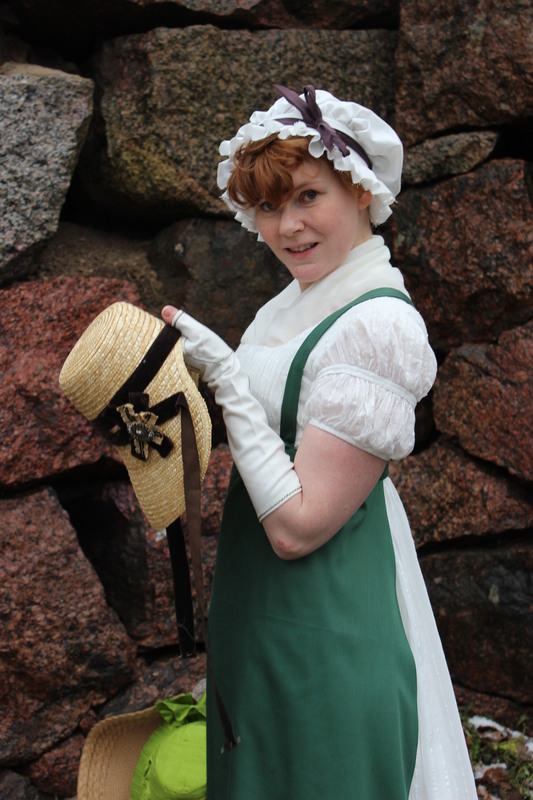 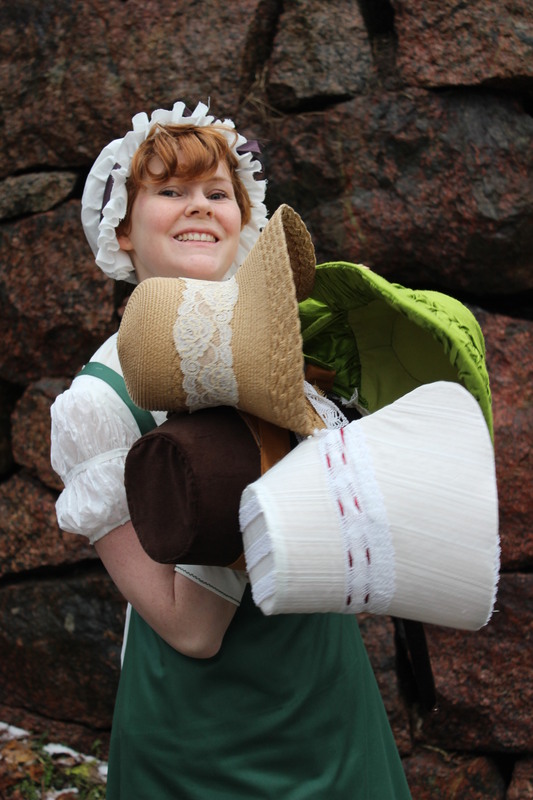 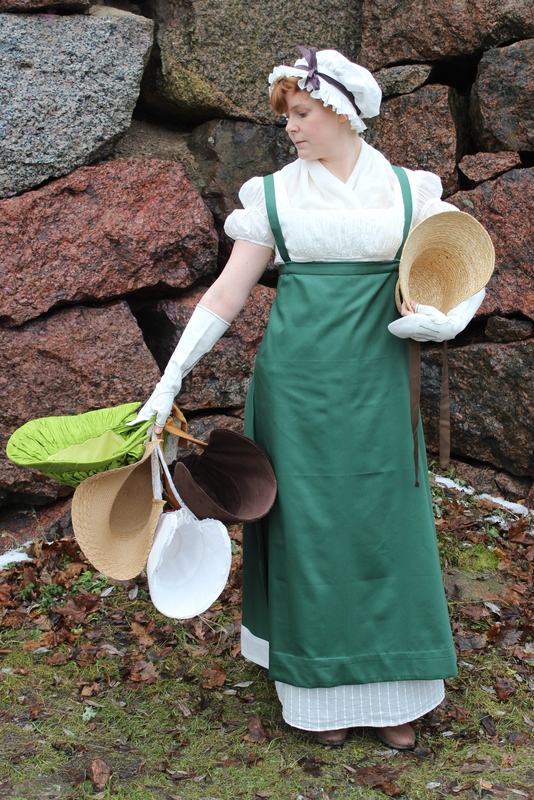 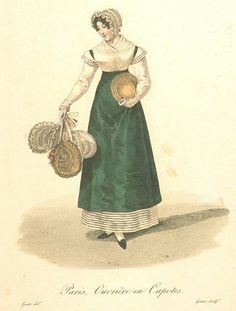 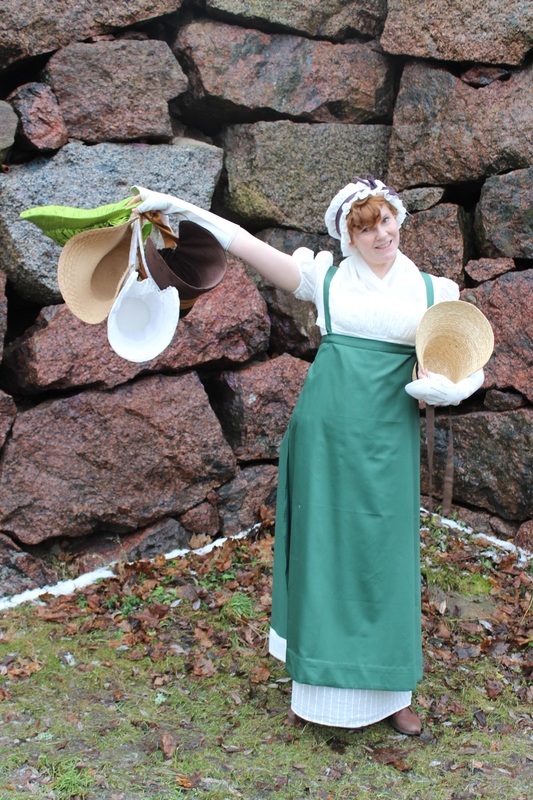 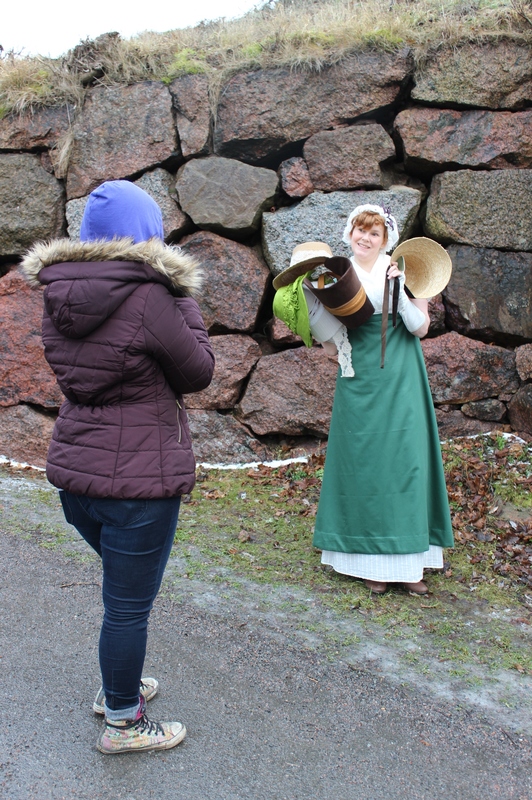 I’m wearing my white regency evening gown, regency stays, cap, fichu, mittens and a few different hats and bonnets (like my green silk 1860s, brown velvet 1840s) for props. 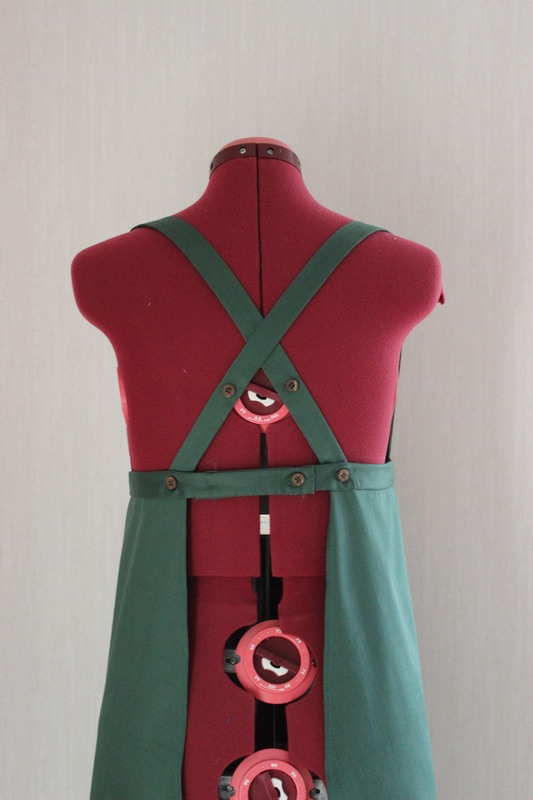 Since my plan is to go for easy pieces this year (yeah, Erhm, sorry that ship’s already sailed) I decided to submit a lovely piece of clothing I started sometime this fall and only finished a little while ago. 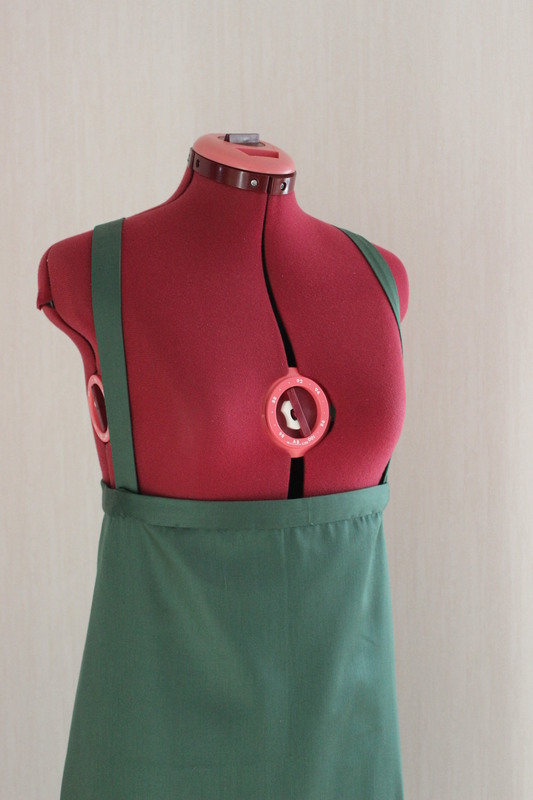 Namely this pretty Apron: I loved this print since I first saw it and been wanting to re-create it for quite some time. 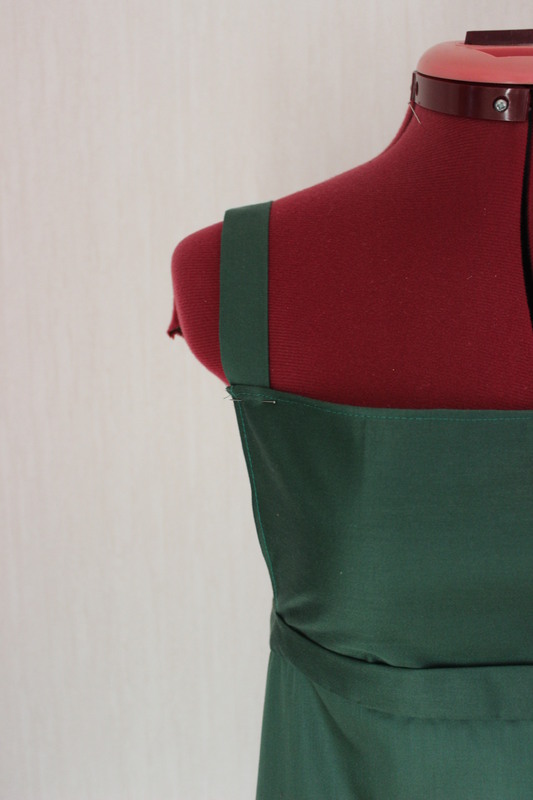 The first thing I did was to dig up a piece of soft cotton satin in a lovely dark green color, which I scored for basically nothing at a flee-market a while back. 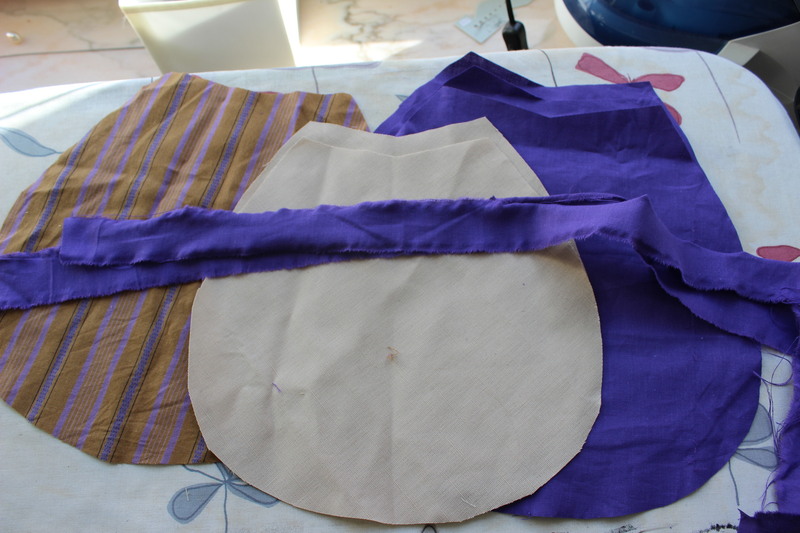 I started by hemming the sides, and bust “flap”, using my sewing machine, since sewing time is scarce at the moment. 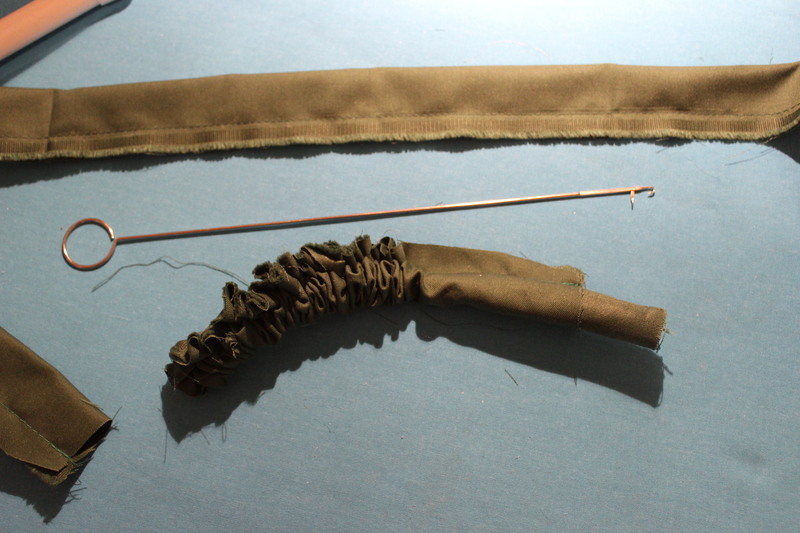 Then I stitched and turned the tubes that was to become the shoulder straps. 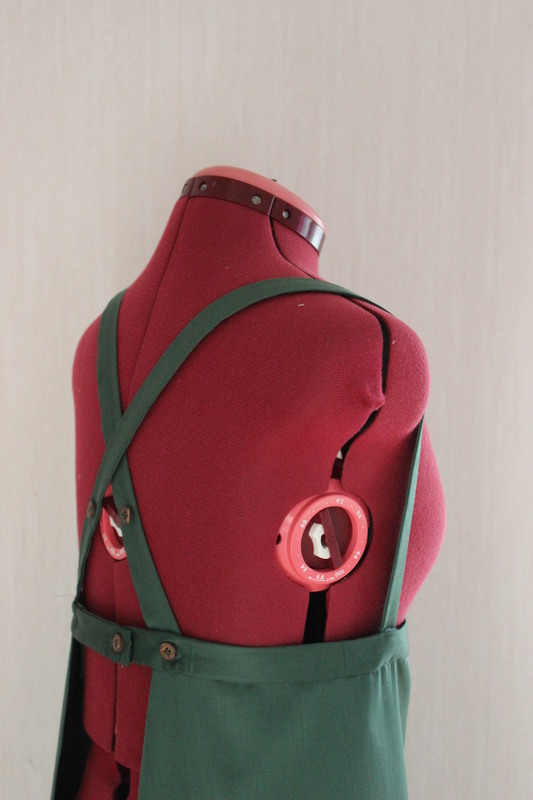 The hardest part was to figure out the bust flap and the closing, since I wanted to be able to wear it in several different ways (Flap up/down, Straps straight/crossed at back) I ended up only attaching the flap at the “waist” so that it could either be folded down (hidden) or pinned to the straps if worn up. 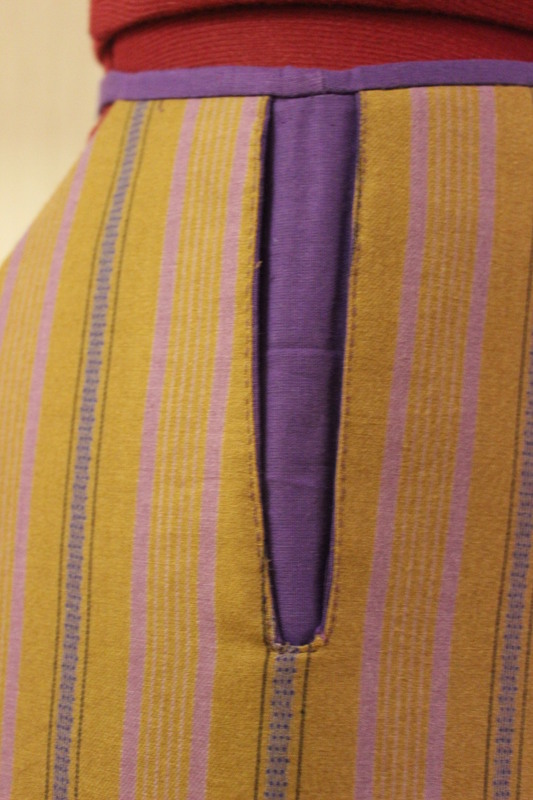 Then I marked the buttonhole placement, and stitched them (using my machine). 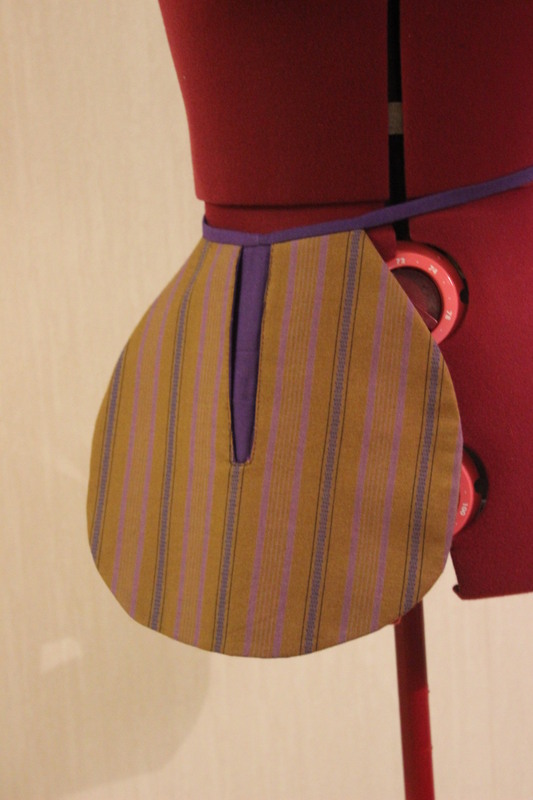 I finished by adding the buttons, and a 10 cm wide piece of linen to the hem to give it some weight. 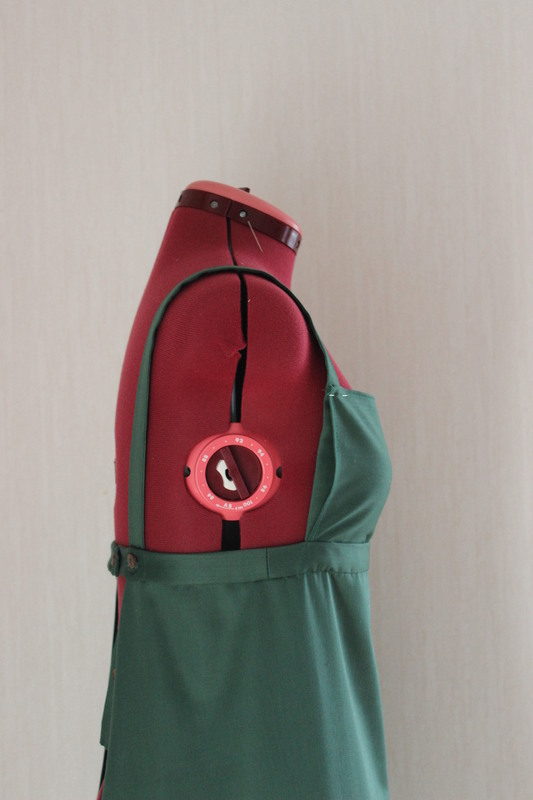 How It fits the challenge: It would be one of the last pieces you put on before leaving the house/doing your chores. 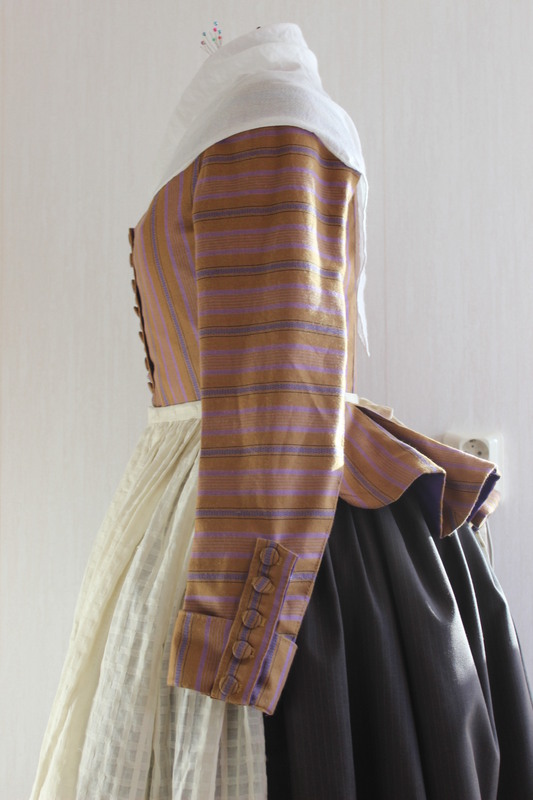 It’ also the my first venture into the late Regency/early Biedermeier but not my last since I now wish to make the whole outfit from the inspiration print. 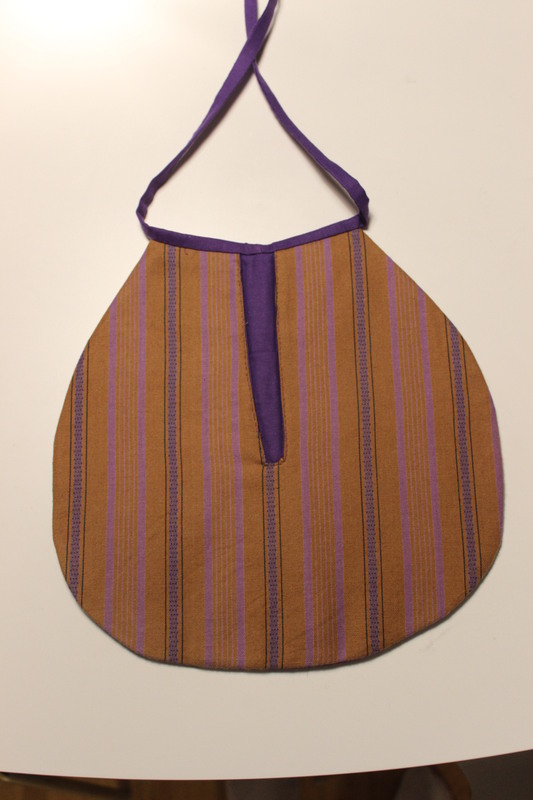 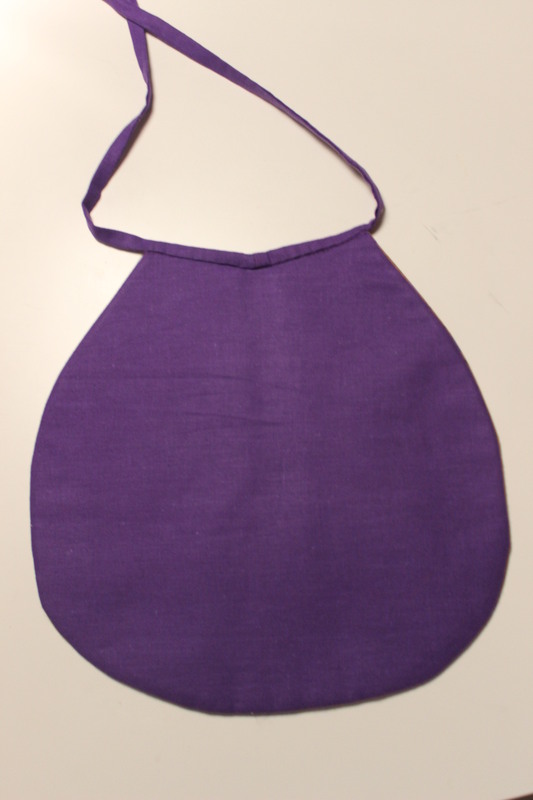 Pattern: None, I drafted my own – It’s basically a trapeze with shoulder straps. 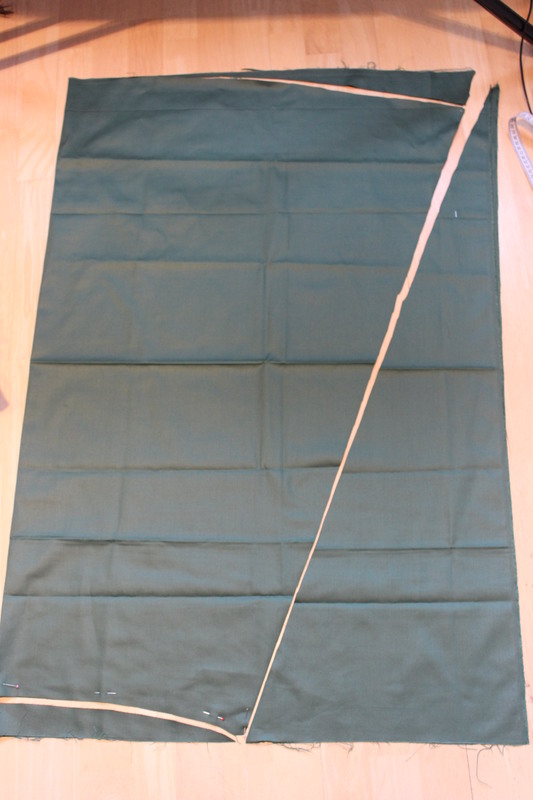 Fabric: 1 m green cotton satin and 15 cm white linen for hem binding. 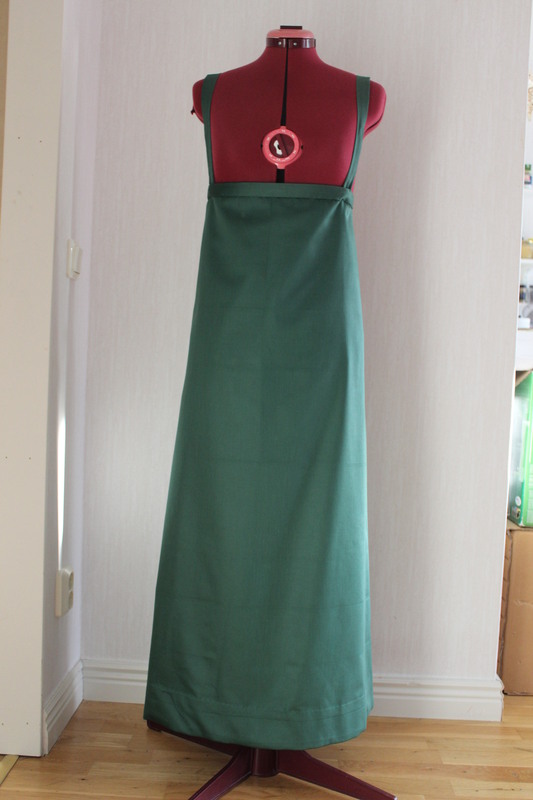 Time: About 4 hours – figuring out the construction took the longest time. 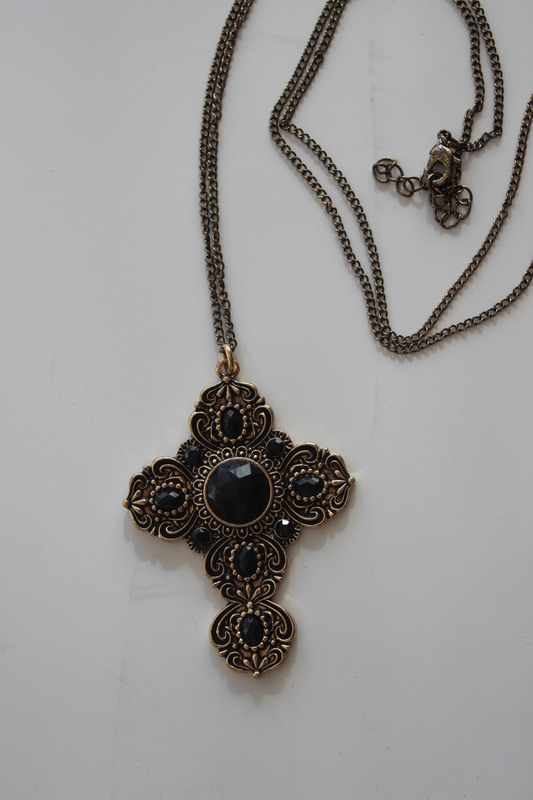 Cost: 30 Sek (3 Usd) – got to love those flee Market bargains. 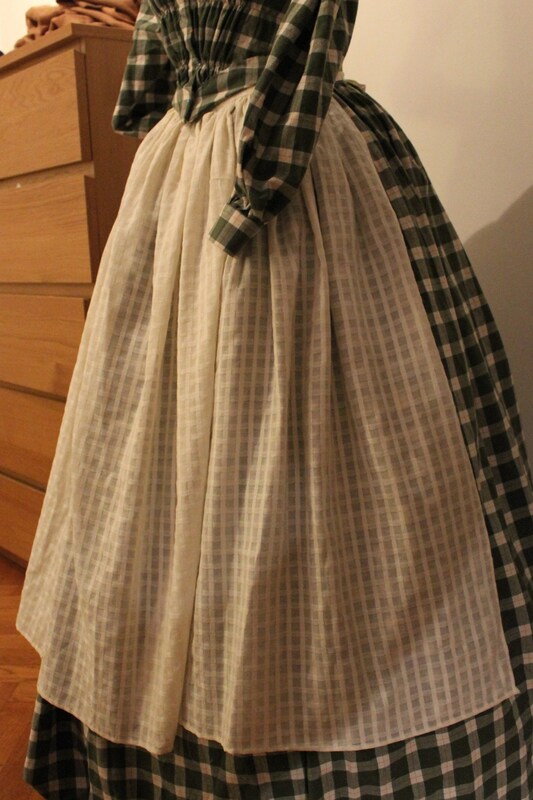 Final thoughts: I think it looks pretty good, and helps “dress down” my more fancy frocks in a pretty way. 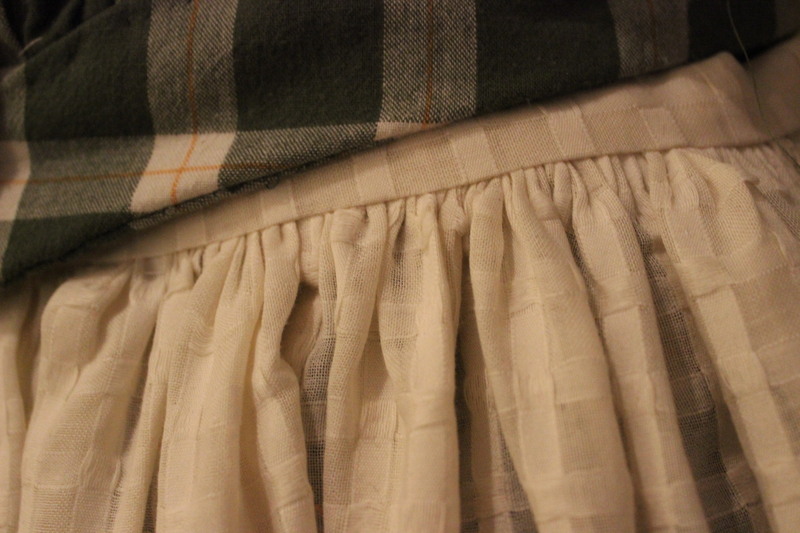 For the HSF Challenge 25: 1 m – I decided to make something simple. 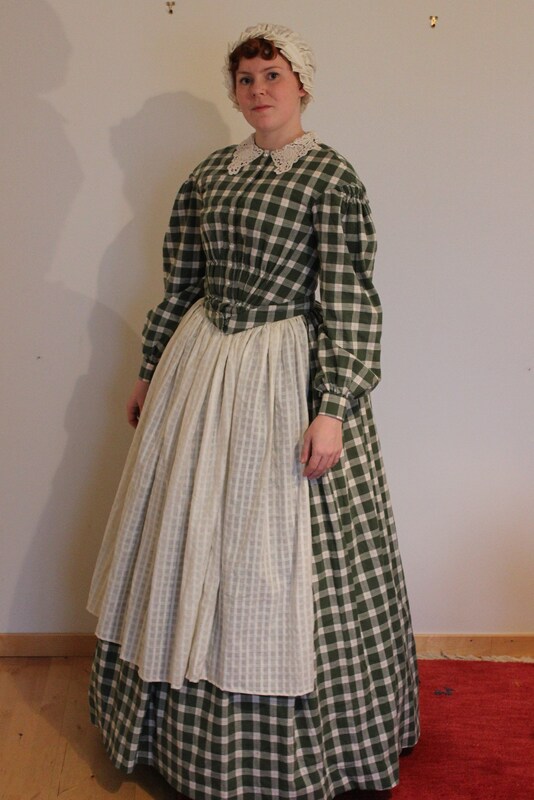 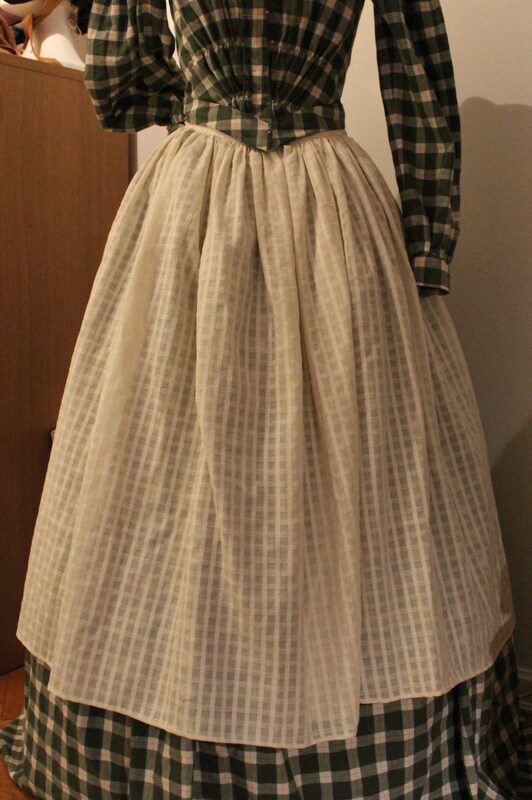 As the prevous challenge been a pretty demanding dress (1840s checkered green dress), I needed to slow down a bit and make a simple yet versetile and wearable piece. 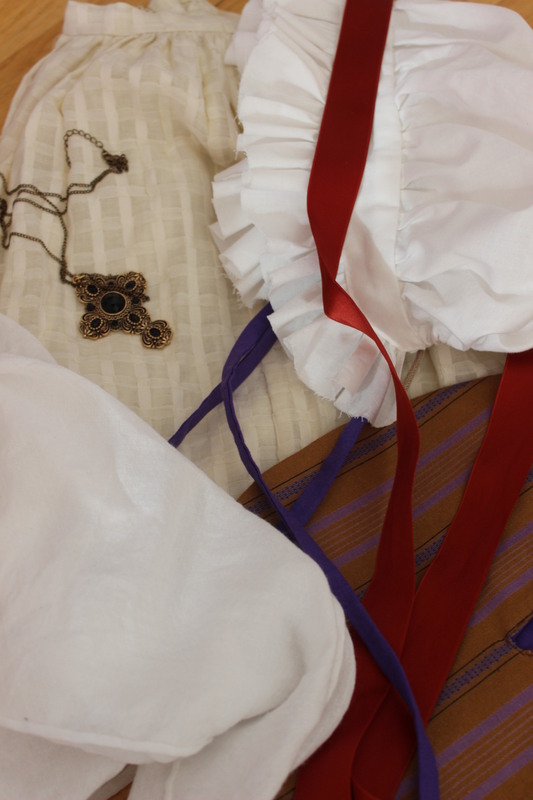 So I went through my stash and found the remaining pieces of this lovely checkered cotton voile, prevously used in my Renesance shirt and 18th century coif. 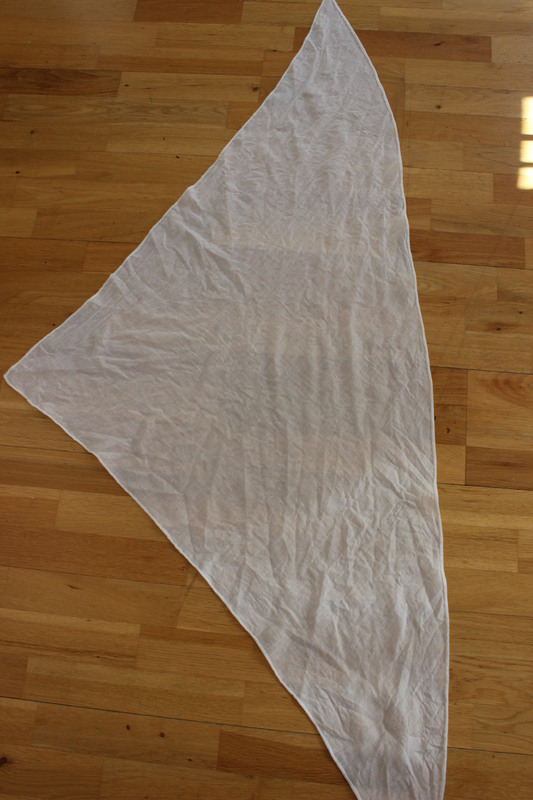 The remaning fabric was a 0,3 x 2,5 m long piece. 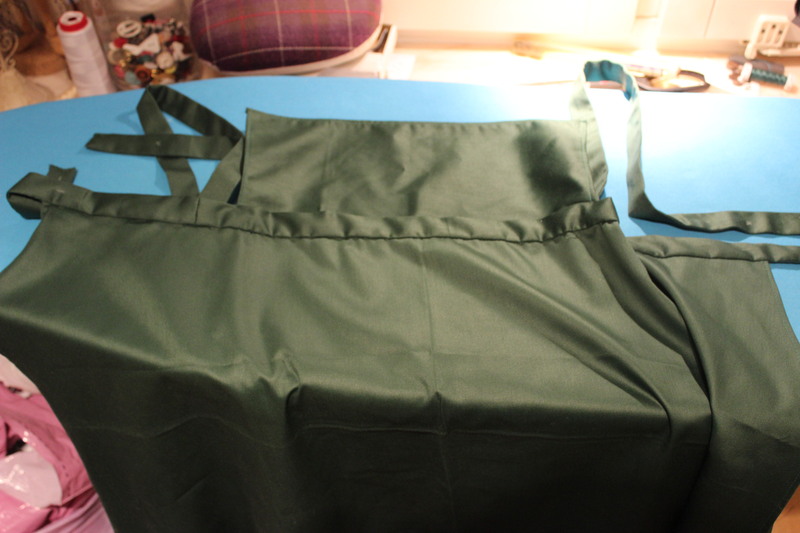 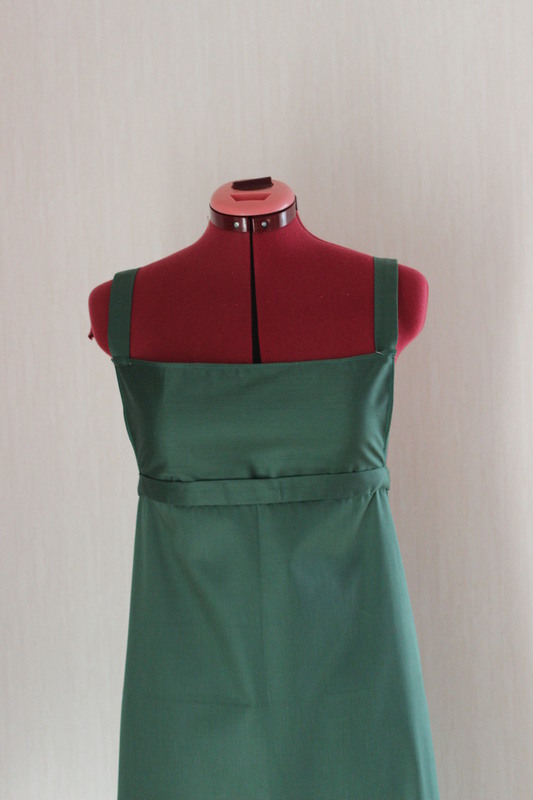 And I decided to make an apron out of it, even though it ment piecing three pieces of 75cm fabric togheter. 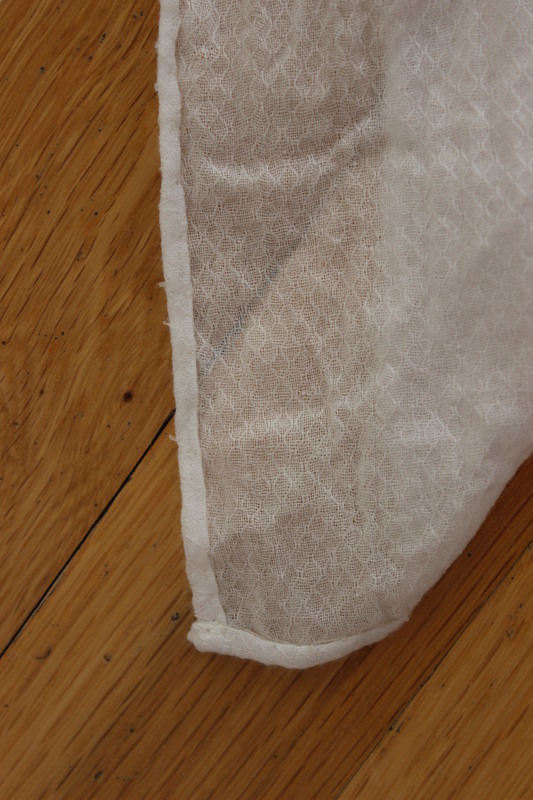 Cutting the long strip in three pieces and piecing them to each other at the vertical seams, and whipstiched them down. 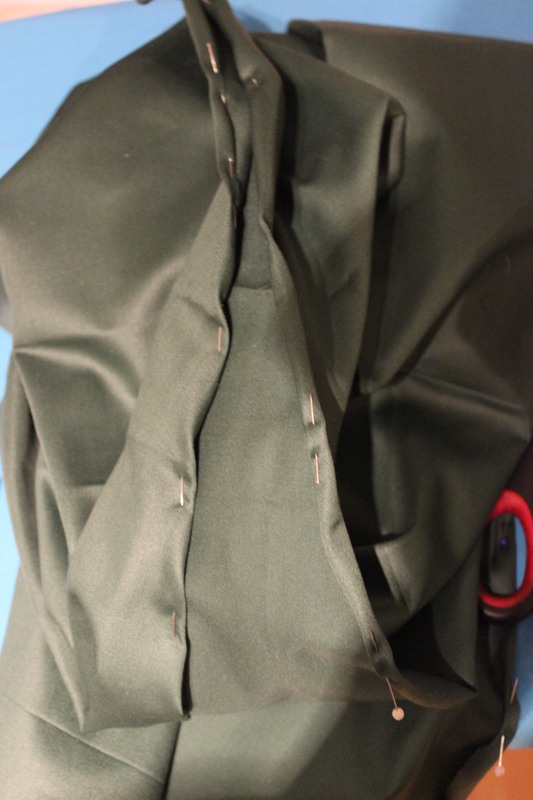 Then I gattered the waist, sewed on a waisband with ties and hemed the whole thing. 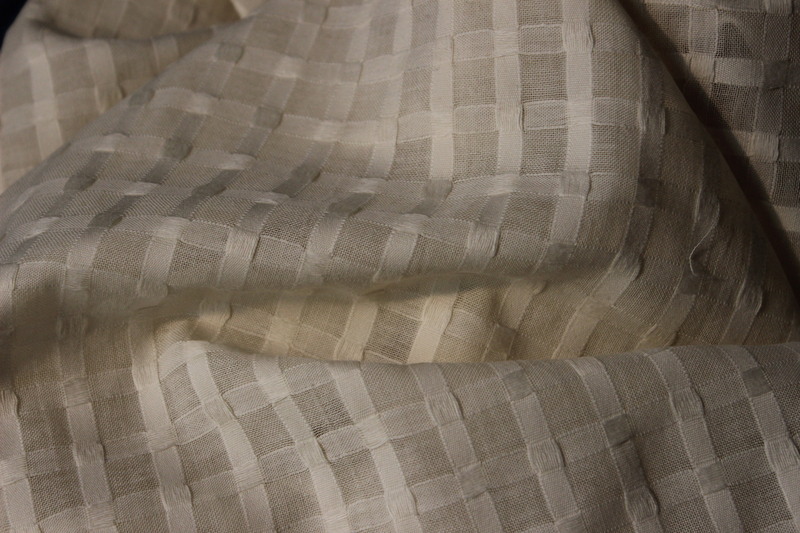 You can’t even see the piecing. 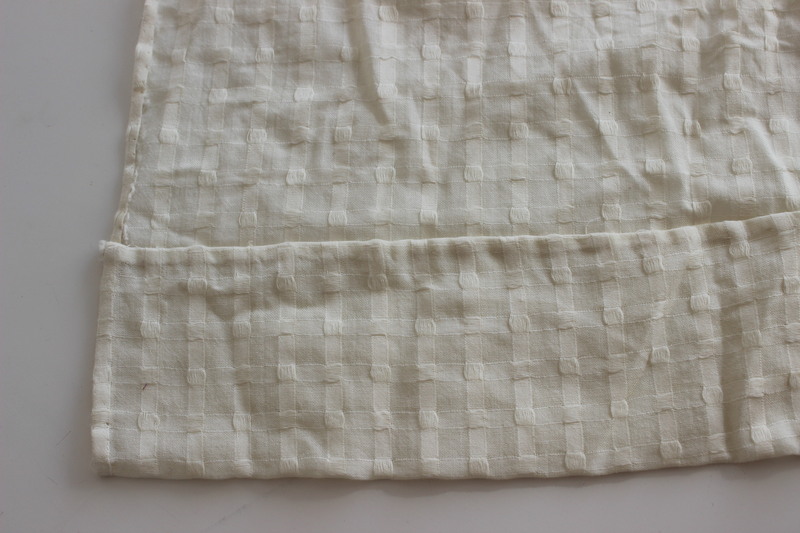 Fabric: A leftover piece of 2,5 x 0,3 m ivory cotton voile. 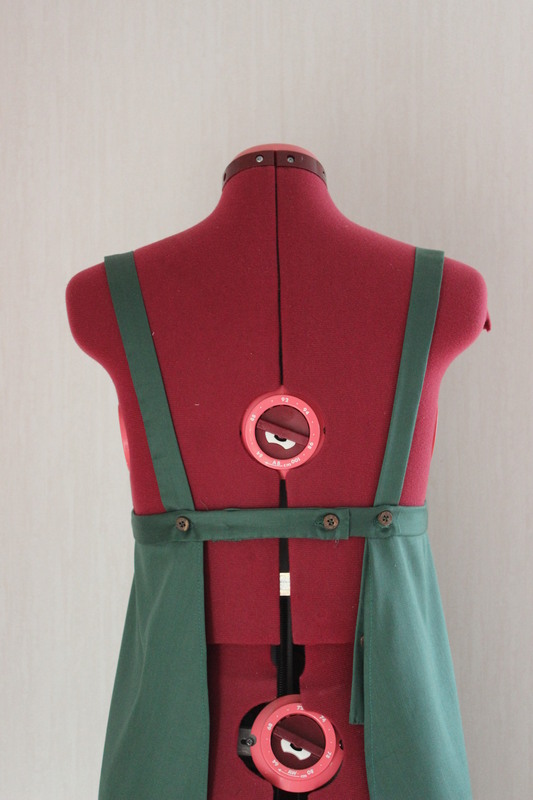 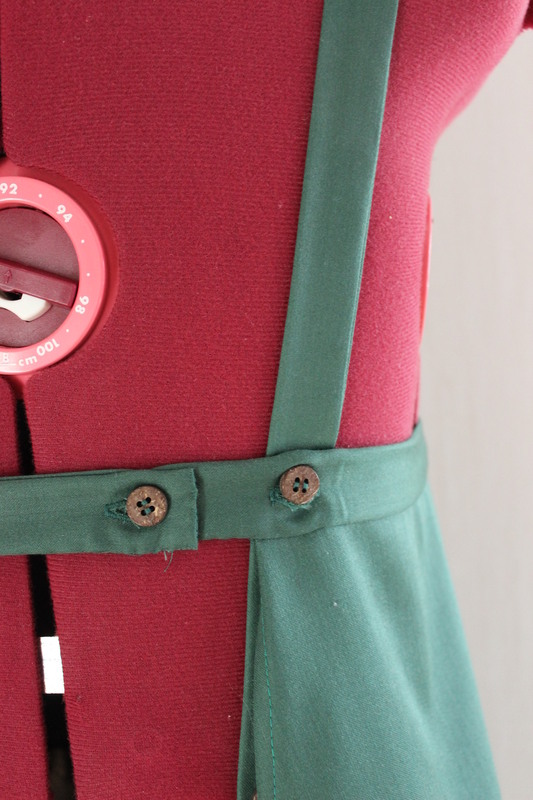 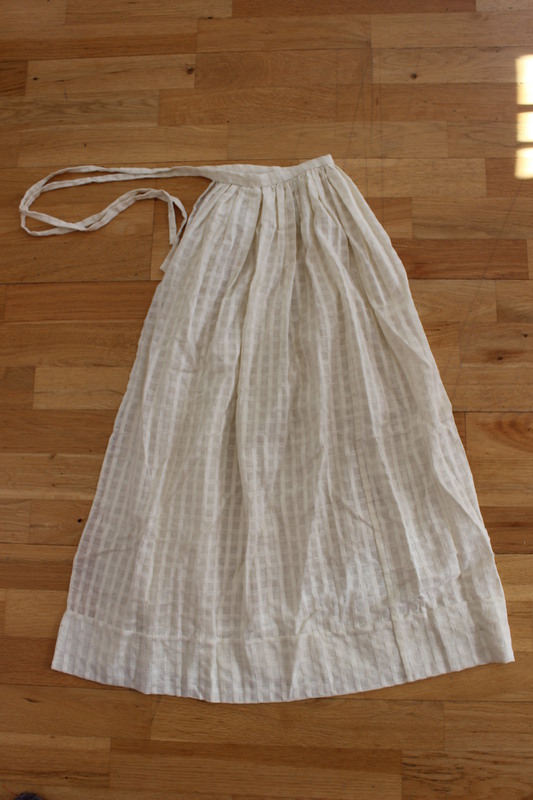 How Historical accurarte: I didn’t use any historical model when making this apron, but figured they were made aproxemetly the same way all through history. 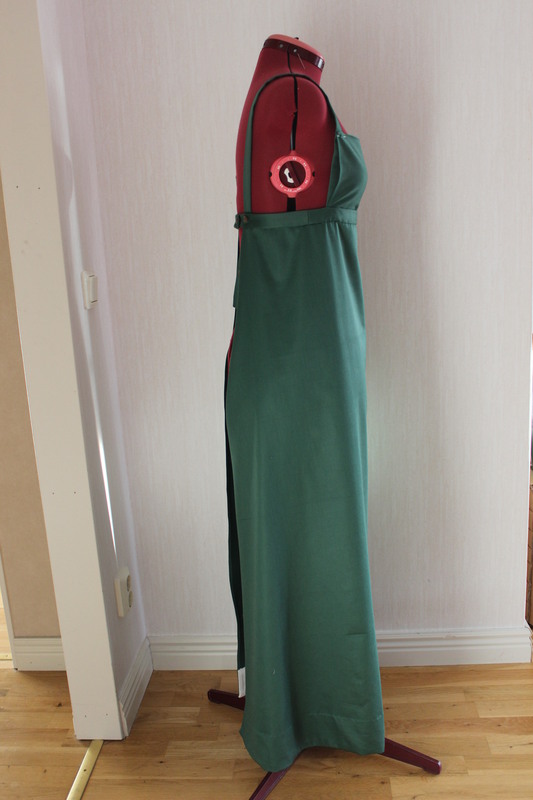 So I give it a 7/10. 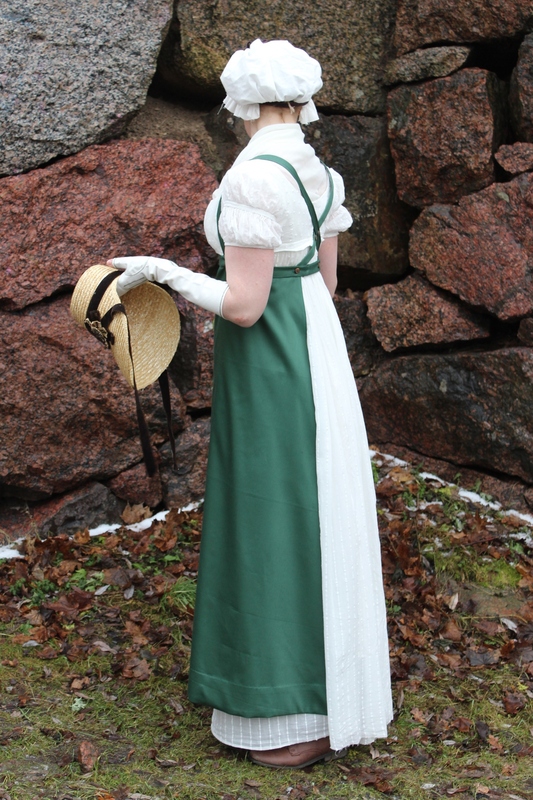 First worn: On the 19th century theemed christams party dec 14.